Following the success of the first-generation model, the Audi Q7 is now in its second generation. It's enormous and well made, as well as sumptously decorated on the inside. It's pitched directly at premium off-roaders such as the BMW X5, Mercedes-Benz GLS-Class, Porsche Cayenne, Land Rover Discovery, Volvo XC90 and Range Rover. It’s a seven-seater, so it could be ideal if you’re looking for a luxurious people carrier with the desirable image of an upmarket SUV (Sports Utility Vehicle) - but be prepared to pay for the privilege, as the entry-level costs from around £47,000. 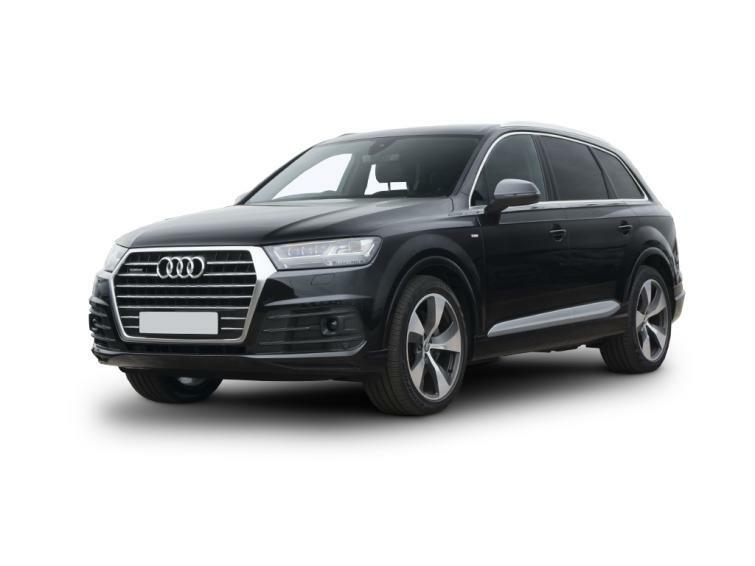 From the outside, the Q7 is instantly recognisable as an Audi with a large, imposing front grille and intricately detailed headlights with LED daytime running lights. It’s a bit plainer and less sculpted along the sides and at the back, but it’s a smart looking car and disguises its size remarkably well in the metal. Inside is where the Q7 plays its trump card. It has a beautifully built interior: the dashboard is made from high-quality materials and everything looks and feels very expensive. Plus, there’s plenty of space for all of the family - there’s even a decent 295 litres of boot space available with all seven seats in place, so it makes for a great choice if you need a large car to carry the family around in. There are two diesel engines to choose from. The 3.0-litre TDI diesel engine has two power outputs, 215bhp and 268bhp, both of which are smooth, quiet and surprisingly economical for such a large car. This engine also forms the basis of a plug-in hybrid version called the Q7 e-tron, which is the most economical Q7 you can get: in theory it can achieve 166.2mpg and emits just 48g/km of CO2 because it’s a plug-in hybrid, so you can charge up the battery to boost efficiency. Meanwhile, at the other end of the scale is the SQ7, which is powered by a 4.0-litre TDI diesel producing 435PS. On the move, the Q7 is no race car (unless you opt for the SQ7, which has a startling 4.9-second 0-62mph time), but it’s very smooth and corners well for a car of its size, with minimal bodyroll. If you pay a little extra for the optional air suspension, the Q7 glides over rough surfaces and is exceptionally comfortable, too. The Q7 also makes for a great car for towing: the powerful diesel engines have plenty of torque, which means it’s strong enough to pull large caravans and trailers. The standard eight-speed automatic gearbox has very smooth shifts, too. The Q7 is a very safe car, scoring a maximum five stars in Euro NCAP crash safety tests. In addition to a well-specified list of standard safety kit, there’s also a long list of optional extras that you can specify to make it even safer, including driving assistance systems such as blind-spot monitoring and a system that keeps you in your lane on the motorway. The Q7 sits in a very prestige (and, as a result, quite expensive) area of the car market, with some seriously premium rivals. The Q7 does have the advantage over some of those rivals by virtue of its seven seats – a third row is an option in the X5 – but all the cars at this level offer high-quality comfort, smooth highway motoring, safety and some degree of off-roading ability. The Q7 vies with the XC90 for the title of Best Interior, while the e-tron offers economy and (theoretical) low running costs. If you’re looking to do some serious, regular off-roading, the Discovery or Range Rover are better bets, but the Q7’s quattro system will enable the soft-roading capabilities that some buyers will occasionally need. The plug-in hybrid version of the Q7 has a 34-mile electric-only range and an official fuel consumption figure of 156.9mpg, while emitting just 48g/km. The extra power of the 272PS 3.0 TDI means the Q7 will handle passengers and luggage with ease. It also has more pulling power if you tow things regularly, plus it shouldn’t be much more expensive to run than the less powerful model. SE spec has all the equipment a family could need, too. All Q7 models come with six ISOFIX points, too. Boasting 435HP from the 4.0-litre diesel engine, the SQ7 is incredibly quick for such a large car, accelerating from rest to 62mph in just 4.9 seconds. There are only four models to choose from in the Audi Q7 range, and it’s this model that makes the least sense. While S line trim makes the car look good, the more powerful SE model is slightly cheaper, while this engine could do with a bit more power if you regularly have a full car. By no means is it a bad version, it’s just more difficult to recommend than the rest. The size of the engine is given in litres (here it's 3.0) and the letters TDI indicate that this is a diesel engine. The engine's horsepower (expressed in PS) is the final number. The Q7 is four-wheel drive and Audi's system is known as Quattro. The amount of standard equipment that is fitted to the Q7 depends on its trim level. SE is the least expensive version, with S Line next, then Black Edition and Vorsprung cars topping the range. Three diesel engines are available in the Q7 range – a 3.0-litre TDI producing 218hp and 272hp, a version with an electric engine that boosts power to 373hp, plus a 4.0 TDI with 435hp. All engines are very smooth and quiet on the move, with the 4.0 TDI offering a more throaty sound when accelerating. The 218hp 3.0 TDI is the more economical engine, with 48.7mpg but it’s also a little slower than the higher-powered version. This is most noticeable at speed when you put your foot down, and it can feel a little strained. It’s also a little more vocal than the 272hp version. The more powerful 272hp 3.0 TDI is more expensive, but the engine is much better suited to the Q7’s size, especially if you regularly drive around with the car fully laden: it has more power and more torque to get you moving and keep you going at speed. It’s also slightly quieter, which contributes to more relaxed car journeys. The plug-in hybrid Q7 e-tron has more power, better performance (0-62mph in 6.2 seconds) and better fuel economy of 156.9mpg – but that’s theoretical and unlikely to be matched in the real world, unless most of your driving can be achieved using electric power only (the batteries give the car a 34-mile range). One advantage it has over the BMW X5 40e and Volvo XC90 T8 – which are also plug-in hybrids – is that the e-tron combines its electric motor with a diesel engine, rather than a petrol one, so real-world economy should be better. And if it's performance you're after, the SQ7 is something of a beast, thanks to its 4.0-litre diesel, producing 435hp. Fuel economy, compared to the other variants, is reduced considerably, to 39.2mpg and 190g/km of CO2 will mean a pretty hefty first-year VED bill. The Q7 model range is easy to navigate thanks to a choice of just four trim levels. Kicking things off is the Q7 SE. All models get a minimalist dashboard design with a pop-up screen in the dashboard and a touchpad and rotary controller for the MMI multimedia system down by the gearlever. SE models come with rear parking sensors, cruise control with a speed limiter and an automatic braking system at low speeds. There’s also satellite navigation and a DAB radio. S line adds larger alloy wheels, a slightly sporty-looking bodykit and bright LED headlights on the outside, while there’s a sports steering wheel and sports seats with ‘S line’ embossed on the headrests. S line also comes with Audi’s Virtual Cockpit, which is a 12.3-inch TFT screen in place of the instrument dials that displays the sat-nav map, multimedia functions and the dials - you can configure them however you like. Next is the Black Edition, which has larger 21-inch wheels and a styling pack with elements such as black surrounds for the grille, frame, front bumper styling accents and door mirrors, while there are black inlays in the cabin, along with an upholstery upgrade, a full-length glass roof and ambient lighting pack. Top of the range is the Vorsprung, which adds 22-inch wheels, running boards, a black styling pack, sports seats, additional leather trim in the cabin, heated rear seats, head-up display, 3D speaker system, wireless phone charging, Matrix LED headlights, a Driving Assistance Tour Pack (including adaptive cruise control, active lane assist and traffic jam assist) and a Parking Assistance Pack. The Q7 doesn’t appear in the 2017 Driver Power survey – it doesn’t sell in large enough numbers for its owners to make enough of an impression – so it's difficult to definitively say how reliable it is. However, Audi doesn’t exactly cover itself in glory in the table of most reliable manufacturers, coming in 18th in the list of 27 carmakers. The Audi three-year/60,000-mile warranty is the similar to the ones offered by the other German premium manufacturers and should cover buyers for any problems in the initial few years after purchase. The oldest models are approaching three years old and used examples look as if they’re retaining their value pretty well, reflecting the level of demand for this flagship premium SUV. Bargains might not be easy to find, therefore. Early cars are still retaining around 70% of their original price, even after two or two-and-a half years, with mileages ranging from around 19,000 to 42,000 (not that they make a huge difference to asking prices).